Belkin's AC1800 is an ADSL2+ wireless router that you should consider if you want to get in on quick wireless networking. The speeds this router can supply in 5GHz, 802.11ac mode are fast, especially if you use a modern laptop with integrated 802.11ac Wi-Fi. Another interesting aspect of this router is its power adapter, which has a port for the phone line. But, apart from that, the physical design and Web interface of this router are both familiar looks. Belkin's AC1800 Dual Band Wireless Modem Router is a two-in-one ADSL2+ modem-router with an 802.11ac wireless performance of up to 1300Mbps. It maintains the physical shape and exterior finish of other recent Belkin routers that we've tested, and its interface is the same, too, but make no mistake, this is Belkin's flagship wireless router for home users. While not much has changed in the overall look and feel of the router, the bump in wireless speed means it's a more potent product than the AC1200 model, which, apart from anything else, means you will have a router that's capable of hitting faster speeds than most current wireless clients can demand. We tested the AC1800 with a Dell XPS 15 laptop that's equipped with an Intel Dual Band Wireless-AC 7260 adapter, which is capable of connecting with a link speed of 867 megabits per second (Mbps) to the Belkin router. If your laptop doesn't have built-in 802.11ac (and only some of the most recent models do), then you will have to pick up a USB adapter such a Belkin's AC Wi-Fi USB adapter (model number F9L1109au), which will allow you to connect at a link speed of 867Mbps, though, in our experience, a laptop with built-in 802.11ac module will give you much better performance. How fast the Belkin AC1800 will perform will depend on your own environment and the types of devices that you connect to it, but for this review we ran the AC1800 in a home environment with two notebooks and two Android phones connected wirelessly, and two NAS devices connected to its Ethernet ports at the back (it has four 10/100 Ethernet ports). We limited our tests to 802.11ac in the 5GHz band, mainly because we think most of you considering this router will be doing so because you want the upgrade in speed. If you merely want to run 802.11n devices in the 2.4GHz bad, then there are much cheaper products for you to choose from, such as this TP-Link N600, for example. We used an Asustor AS-202TE NAS device to serve data to our wireless Dell laptop over the 802.11ac network, testing both from short range (2m) and long range (15m), and with a variety of large files (video files) and small files (mp3 files). In our short range test, our 802.11ac-connected Dell laptop received large files from the Ethernet-connected Asustor NAS device at rate of 29.09 megabytes per second (MBps), and small files at a rate of 30.01MBps. Both types of file transfers peaked at a maximum of 35MBps. This is stellar performance if you want to move lots of files around from distances that are relatively close to the router, and it's noticeably faster than what we saw from the last 802.11ac router that we tested, D-Link's DSL-2890AL (though it got 24MBps in the same test using a D-Link USB adapter rather than an 802.11ac module in a laptop). Against a more humble, 802.11n router such as TP-Link's N600, the Belkin is about 20MBps faster. From a distance, the transfer rates will vary greatly depending on the obstacles that are present in your own environment, and especially if the signal has to travel through walls or up floors. Generally, the 2.4GHz network has the advantage when it comes to maintaining and facilitating a usable signal over longer distances, but 802.11ac is also touted as being a robust connection over a long range. In our tests from 15m, the 802.11ac network achieved an average transfer rate of 10.63MBps. It's not a mind-blowing result by any means, but it's magnificent compared to the 2.4GHz performance the Belkin mustered. At 15m, the Belkin AC1800 could barely supply a usable 2.4GHz signal, let alone transfer any files. It's short range 2.4GHz performance was below 3MBps. We tested in an apartment environment surrounded by many 2.4GHz routers, so the 5GHz network allowed us to operate in a relatively clutter-free space. When we went up one floor, though, even the 802.11ac, 5GHz network had trouble keeping a connection. The AC1800 actually sports a feature we haven't seen before, and that is a power adapter that has the modem located in it. This means that if your phone line is located near your power outlet, you won't have to run the phone cable all the way to your router; just plug it into the power adapter and the cable that already runs from the power adapter to the router will carry the ADSL2+ signal, too. The length of cord from the adapter is standard at about 2m. In terms of modem performance, the AC1800 recorded a download speed of 9.27Mbps in our Broadband Speed Test, and an upload speed of 0.83Mbps. Both are expected results from our test location. The connection, and the router overall, was stable during our prolonged test period of over one month, though the router features a self-healing feature that restarts the router at a pre-set day and time so that problems don't really have a have a chance to manifest. The Web interface of the AC1800 is the same as previous Belkin routers that we've seen. It's basic in its layout and has all of the features you would expect of a home router, including port forwarding. One of the features that isn't enabled by default is the quality of service (QoS) feature called Intellistream. This has the ability to prioritise streaming video over other tasks. In our tests, we ran BitTorrent downloads in the background while we streamed NBA League Pass video at 3000Kbps (375KBps). As the downloads reached 1MBps, the video stream stopped. When we enabled Intellistream, the downloads in the background never peaked faster than 695 kilobytes per second (KBps), leaving enough for the video to stream uninterrupted while the downloads continued. 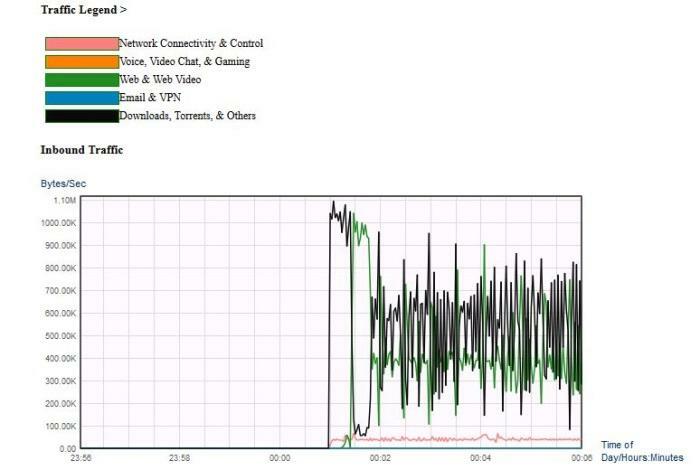 You can look at a graph of your Internet traffic after you enable Intellistream. Here, our streaming video traffic and BiTorrent downloads co-existed hapily. Here you can see the Web interface layout. 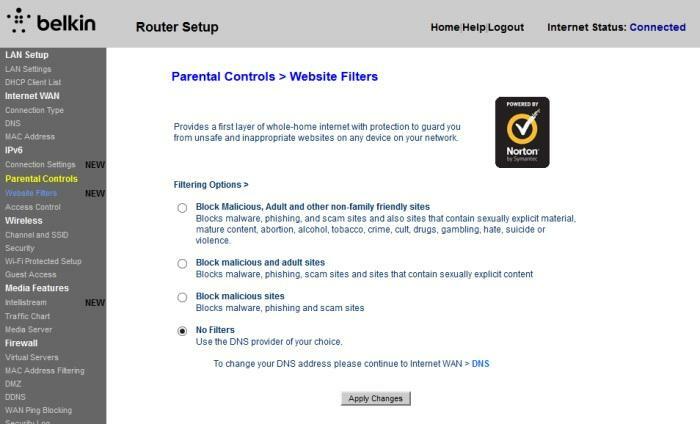 We're showing the parental controls in this image, and these controls rely on a DNS service from Symantec to block known untrustworthy sites. 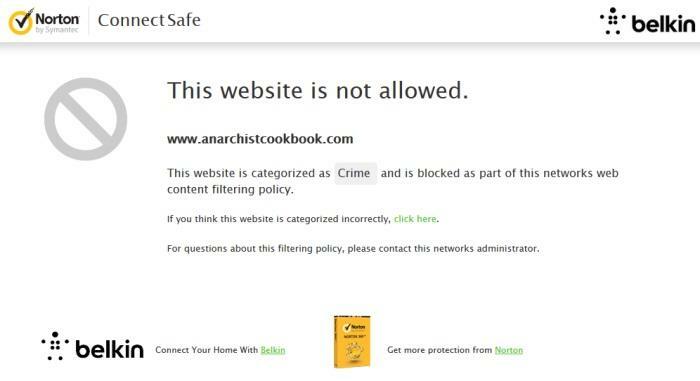 If you enable the parental filter, some sites won't be accessible, but will instead load a warning page like this one. The DNS servce can slow down the perforance of the Internet in general while you browse. There are a couple of USB ports at the back of the router, through which you can share USB hard drives across your network. File transfers from connected drives won't rival those from a dedicated network attached storage (NAS) device, but they will be decent enough. We managed to get an average of 3.79MBps when transferring files from an attached USB 3.0 drive to our Dell laptop over the 802.11ac network. The $299 price tag is indicative of what you're getting in the Belkin AC1800 Dual Band Wireless Modem Router. Not only is it a two-in-one ADSL2+ modem and wireless router unit, its wireless networking capability is among the fastest you can currently get. We don't have much good to say about its 2.4GHz performance, especially over the long range, but we can vouch for its 802.11ac performance, especially when using a modern laptop with built-in 802.11ac. It was fast in our tests, and even performed well over longer distances. Consider this router if you want to start building up a quick 5GHz wireless network, in particular if your home is surrounded by lots of 2.4GHz routers.